NEW! BUY A 30-DAY SUPPLY OF SAFTEA® LINER ONLINE! Saftea® Liner is now available in handy 30-day supplies! 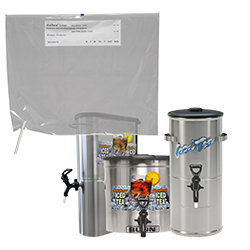 30-day supplies are ideal for restaurants and organizations that require smaller quantities. Now, it is easier than ever to simply go online and place your order for this compact 30-liner option. With three different options to choose from, you can select the version that works best for your needs. Note: larger case quantities are also available. Contact us for more information on larger orders. If you already have a supply of Saftea® Liners and just need a replacement or additional spigot, this is the option to select. If you are new to Saftea® Liner, please see the option to purchase "30-day supply + 1 pinch-tube spigot". 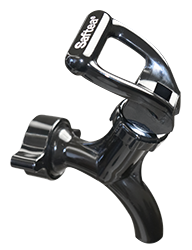 If you have never used Saftea® Liner, then you will want to select the option that includes a pinch-tube spigot. 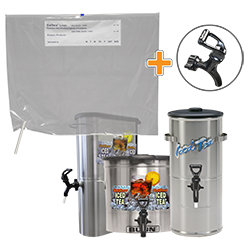 Saftea® Liner can only be used in tea urn dispensers that have this style of spigot, as the integrated tube on the liner feeds directly through the pinch-tube spigot, ensuring that tea does not come in direct contact with the urn or spigot. If you are already using Saftea® Liner and do not need an extra pinch-tube spigot, be sure to select the option that does not include the spigot. Additional pinch-tube spigots can be ordered at any time as replacements, or for use on additional tea urn dispensers as your business grows and expands. Currently online shipping is available to ship in the US only. For regions outside of the US, please contact us for alternative shipping options. Maximum order: 5 boxes per mailing address.